Every week we pull together some great Canadian recipes from Canadian food bloggers around the web featuring one main ingredient or dish. This week, we're getting ready to celebrate with 10 Lunar New Year Recipes! If you've ever wondered what to eat during Chinese New Year we've got you covered this week. Chinese New Year, which is also often referred to as Lunar New Year because it's actually a holiday that's celebrated in many Asian countries that follow Lunar calendars, is one of the most celebrated holidays in the world! The new year is usually in late January or early February but moves around from year to year and shifts depending on the moon's cycles. It's a festival that goes on for several days and like most holidays and festivals, there's a lot of delicious things to eat! 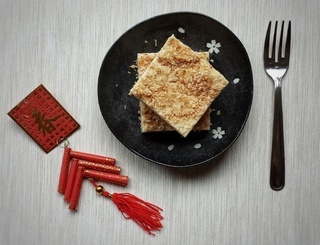 Like many holidays, one of the most important things to know about food served during Chinese New Year is that almost every dish is symbolic and has more than one meaning - usually surrounding prosperity and health for the coming year. There are also a lot of puns involved with words that sound similar to other words. There is so much more going on here than just some really good food and it's fascinating to learn why each dish is significant as well as some of the puns that go along with them. Many of the recipes shared here are authentic family recipes shared by FBC members who celebrate the Lunar New Year. Some of have put their own western twist on their recipes like Joyce's Apple Dan San, and others have shared interesting and lovely stories behind their dishes - like why Vicky from Tiny Sweet Tooth makes her Baked Coconut Sticky Rice Cake in a round pan. And Mairlyn from Family Food Around The Clock, whose roots are in Portugal, shares the connection between the Portuguese Egg Tart and the Chinese Egg Tart! And of course, it wouldn't be a Chinese New Year recipe collection without sweet AND savoury versions of Nian Gao and multiple Chinese Potsticker recipes... because let's face it, they're so addictively good! Here's our collection of 10 Chinese New Year's dishes for you to try at home! **The Joyce of Cooking** took the classic Chinese New Year treat of **[Dan San](https://joyceofcooking.com/comforts-of-the-east-meets-flavours-of-the-west-the-apple-dan-san-is-born/)** (which means "deep fried egg goodness" and we're all for that!) and put a western spin on it by making it with apples! And if you needed any more reason to try it, Dan San signifies having more prosperity each year. Sounds delicious to us! **[Baked Coconut Sticky Rice Cake](https://tinysweettooth.com/2017/01/27/baked-coconut-sticky-rice-cake-for-lunar-new-year/)** from **Tiny Sweet Tooth** is a Lunar New Year cake she remembers from her childhood and she tells us the lovely reason why she bakes it in a round dish! Evelyne from **CulturEatz** has declared that her **[Chinese Peanut Cookies](https://cultureatz.com/hua-sheng-bing-chinese-peanut-cookies/)**, also known as Huāshēng Bǐng (pronounced Hua Sheng Bing) may be one of her top 3 cookie recipes ever. That makes them a definite one to try for Chinese New Year! Both fish and rice cakes are meant to bring prosperity to the lunar new year and in this dish you get both. These **[Salmon Fried Rice Cakes](https://www.diversivore.com/salmon-fried-rice-cake-chao-nian-gao/)** (Chao Nian Gao) from **Diversivore** use a savoury rice cake that's one of our all time favourite things to eat. They're chewy and soak up all the flavour of the dish. So good! Here's another version of **[Nian Gao](http://www.cynfulkitchen.ca/recipe/nian-gao/)** that you might be more familiar with - this is the sweet version from **Cynful Kitchen** that looks more like an actual cake. Cynthia shares a lot of her family's memories around making this delicious treat. You can't have a New Year's Celebration without candy. **Yang's Nourishing Kitchen** shared this (paleo friendly!) **[Sesame Candy](https://yangsnourishingkitchen.com/sesame-candy-korean-paleo-cookbook/)** as part of her review of the Korean Paleo Cookbook by Jean Choi. **[Chinese Pot Stickers](https://www.shelovesbiscotti.com/easy-homemade-chinese-pot-stickers/)** might be the most familiar dish on this to many of us and with good reason - these are little bundles of flavour wrapped in dough and they are so tasty. The also signify prosperity as their shape resembles little gold ingots. This version is from **She Loves Biscotti**. You really can't have Chinese New Year with just one dumpling so we have three. Just like pierogies or gyoza, these delightful dumplings can have a variety of fillings. **[This version](http://www.vibrantfoodvibrantyou.com/recipe/549/)** comes from **Vibrant, Food, Vibrant You**. And our last take on the [**Chinese Potsticker** ](https://foodmeanderings.com/chinese-potstickers/)comes from **Food Meanderings**. She shares some interesting details on what makes Potstickers different from gyoza or won tons!